In addition to trademarks, trade dress is another way for a company to protect its reputation. While a trademark addresses the company’s brand, the trade dress refers to the characteristics of the visual appearance of a product or the product’s packaging. Many companies use distinctive packaging to distinguish their product from their competitor’s. Frequently, consumers can identify a product simply by looking at a silhouette of the box. Similarly, trade dress can be utilized to protect a building design associated with sales of a particular brand, such as a restaurant or a retail store. One of the simplest ways to present a product to the consumer is to put it in a generic box with a logo and/or the product image. In this case, the marks used may be distinctive, and therefore protected, but the packaging of the product is generic and does not serve to distinguish the product in the eyes of the consumer. A more sophisticated strategy is designing a box of a specific shape and/or type of material. The trademarks would likely still be on the package, so the consumer could very easily ascertain what they were purchasing. The box itself would also be distinctive and therefore protectable as trade dress. This unique packaging may elicit a certain feeling in the consumer, thereby attracting them to the product and/or making it much easier to spot the particular brand on a shelf of competing products. In the United States, the legal support for protecting trade dress is found in the Lanham Act. “Any person who, on or in connection with any goods or services, or any container for goods, uses in commerce any word, term, name, symbol, or device, or any combination thereof, or any false designation of origin, false or misleading description of fact, or false or misleading representation of fact, which (A) is likely to cause confusion … as to the origin, sponsorship, or approval of his or her goods, services, or commercial activities … shall be liable in a civil action by any person who believes that he or she is or is likely to be damaged by such act.” 15 U.S.C. § 1125(a) (2016). According to the Trademark Manual of Examining Procedure (TMEP), § 1202.02 defines a trade dress as a “symbol” or ‘device’ within the meaning of § 2 of the Trademark Act.” (2017). The TMEP goes on to say that, although trade dress originally only referred to the packaging or “dressing” of a particular product, it now has been expanded to also include the design of the product. Courts in the United States have defined trade dress as a product’s “total image” or “overall appearance” and “may include features such as size, shape, color or color combinations, texture, graphics or even certain sales techniques.” John H. Harland Co. v. Clarke Checks, Inc., 771 F.2d 966, 980 (11th Cir. 1983). Of course, the shape of the product itself comprises the total image, but the product’s packaging or presentation is also part of the total image. An example of packaging that is protected by trade dress is the Coca-Cola™ bottle. The Coca-Cola™ bottle has a distinctive shape. A beverage can be sold in any type of bottle, so the contours of the bottle are not functional. Without the logo, a consumer can still easily recognize the bottle shape as being associated with Coca-Cola™. Because Coca-Cola™ has obtained trade dress protection on the bottle, no other beverages may be sold using that bottle shape. 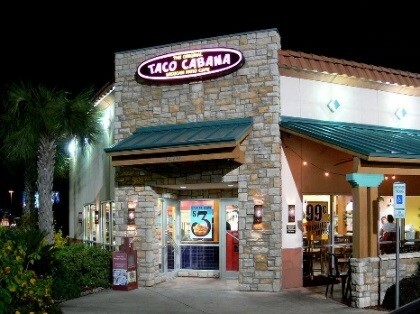 An example of a building that is protected by trade dress is the design adopted by restaurant Taco Cabana™. In fact, the case Two Pesos, Inc. v. Taco Cabana, Inc., 505 U.S. 763 (1992) established trade dress protection in the United States. In this case, the Supreme Court of the United States held that trade dress is inherently distinctive under the law. The Court held that a trade dress, “remain(s) inherently capable of distinguishing the goods of the users of these marks.” Two Pesos, 505 U.S. at 772. The Ride™, an entertainment company offering tours in New York City, obtained trade dress protection in the United States, as well as other countries, for the exterior view of their tour bus. The United States Trademark number for the trade dress is 5,367,214, and the image of the trade dress appears below. As the image shows, the people on the bus are part of the trade dress – when people on the sidewalk see a bus that has passengers facing the sidewalk, this is an indication that the bus is associated with The Ride™. The trade dress registration can be examined in more detail at The United States Patent and Trace Mark Office. To register a trade dress with the United States Patent and Trademark Office, the requirements are the same as they are for a trademark: the trade dress must be distinctive and non-functional. The process required to register a trade dress is the same as the process required to register a trademark, and the examination standards are the same. If a trade dress is not registered, regional protection may be proven in court if the plaintiff is able to show that the trade dress has acquired secondary meaning in the eyes of the consumer. Registering a trade dress, however, provides national protection without the necessity of showing secondary meaning. Another aspect of trade dress is the potential confusion with design patents.. Trade dress and design patent are actually just various ways to protect a design - it is possible for a particular design to be protected by both a trade dress and a design patent. As described above, because trade dress falls under trademark, a trade dress may not be functional. Accordingly, “if a feature of the trade dress is ‘essential to the use or purpose of the article or if it affects the cost or quality of the article,’” the feature may not be part of a protected trade dress. (TMEP § 1202.02(a), citing Qualitex Co. v. Jacobson Prods. Co., 514 U.S. 159, 165 (1995). Similarly, a design patent is available for a new, original, and ornamental design for an article of manufacture. 35 U.S.C. § 171. If a company has obtained a design patent on a design, the design patent provides support for the argument that the design is ornamental, or non-functional. Accordingly, the existence of a design patent may be used as evidence that the design may be registered as a trade dress. TMEP § 1202.02(a)(v)(A) (2017). A significant investment to develop unique packaging = significant benefits. A distinctive trade dress may elevate the brand in the market thereby increasing sales and/or allowing the company to increase price . A distinctive trade dress may also make it easier to distinguish a commodity from a similar product sold by a competitor, thereby allowing a company to build brand loyalty in an otherwise competitive market. Accordingly, developing a trade dress is an important strategy for the modern sophisticated business. If the company takes the time and resources to develop the trade dress, it is a simple matter of protecting the trade dress under modern trademark law. If you have any questions or comments regarding trade dress, please contact Tammy Tanner, Attorney at Trusted Counsel, Atlanta, Georgia (ttanner@trusted-counsel.com). Tammy Tanner has a strong background in intellectual property and technology transactions. She advises clients on structuring strategy, implementation and management of intellectual property legal issues (domestic and international) as well as brand protection, including building creative protection. Tammy graduated from Jacksonville University with a B.S. in applied mathematics and obtained her J.D. from Emory University in Atlanta, Georgia. Trusted Counsel (Ashley), LLC provides seasoned, practical and confidential legal services for businesses. Based in Atlanta, this corporate and intellectual property law firm is dedicated to serving the unique needs of companies, investors and legal departments. Trusted Counsel’s attorneys make a difference. Their focus is to guide and empower clients with exceptional legal counsel, knowledge and tools that lead to practical, informed business decisions. Trusted Counsel’s Managing Partner Evelyn Ashley and Partner John Monahon co-host “In Process: Conversations about Business in the 21st Century,” a podcast where national guests are interviewed on emerging business trends, ideas and techniques. Visit trusted-counsel.com for more information. The reasons for obtaining both trade dress protection and design patent protection on a design are partially economic in nature. Some of the value of a brand lies in the development of the intellectual property protecting the brand. Accordingly, the more types of intellectual property registered to protect a design, the more valuable the design. Additionally, obtaining various types of intellectual property may provide additional leverage against potential infringers of the product.